Whoever exports measuring instruments or other technical goods to Russia and many of its neighbouring countries, has to go through the certification process of the “Eurasian Conformity” (EAC). An EAC approval is comparable with CE conformity. It is issued for each instrument type. Russia, Belarus and Kazakhstan are a significant market for manufacturers of measuring instruments. These three countries are also founding members of the “Eurasian Economic Community”, to which other members of the “Commonwealth of Independent States” (CIS) have joined. For the export of measuring instruments into this customs union, an EAC approval is generally required. This confirms that the instruments conform to the requirements laid down in the technical regulations of the member states. The EAC document has, for example, replaced the previous GOST-R certificates in Russia. In many cases, further certificates are associated with the document. 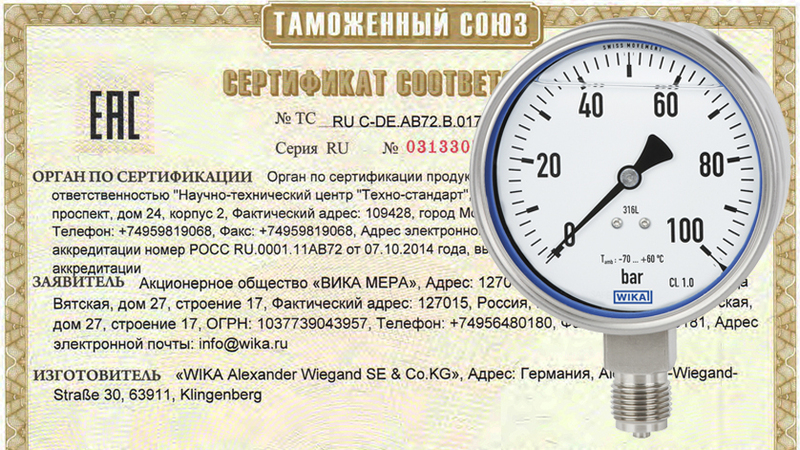 The following table gives an overview of approvals and documents with which WIKA pressure gauges and WIKA thermometers can be delivered to the most important EAC countries, and also to the closely connected CIS states of Ukraine and Uzbekistan. The EAC certificate is binding for all measuring instruments intended for the territory of the Eurasian customs union and subject to the technical regulations (in short: “TR CU”). For mechanical thermometers, however, this regulation only applies to instruments with Ex protection, all others are supplied with a “negative certificate” by WIKA. An EAC Ex certificate is issued exclusively for pressure gauges and dial thermometers with ATEX approval. Each EAC certificate is accompanied by an equipment pass in line with GOST 2.610-2006 and GOST 2.601-2006. Additionally, metrological certificates are needed in many cases. For exports to Kazakhstan, Uzbekistan and Ukraine, this certificate also includes an initial calibration. Measuring instruments intended for Russia can be supplied with a separate initial calibration certificate (“legal calibration certificate”). Thus there is an individual verification for each instrument supplied. It contains the serial number and also the date of the initial calibration, the measured values of which are documented in a separate 3.1 certificate in accordance with EN 10204 with a listing of the single measured values. All information in the certificates and the equipment pass must be written in Russian. Further information on the subject of product approvals can be found on the WIKA website.